In 2017, now with better name recognition, she got an early start, announcing her candidacy for supervisor in January and often speaking out on issues at Town Board meetings throughout the year. By spring, she had secured nomination for supervisor on the Democratic, Independence, Working Families and Women’s Equality lines and her campaign was launched. It paid off. Ms. Jens-Smith easily defeated eight-year incumbent Sean Walter in November to become Riverhead’s first female supervisor. 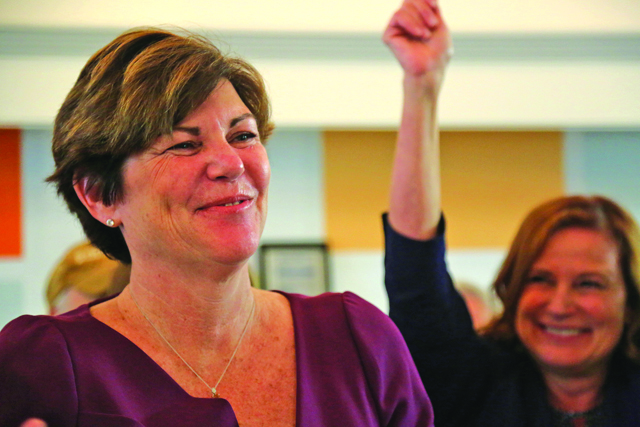 Combined with the victory of her Democratic running mate Catherine Kent, it will also give the town its first all-female majority, since Republican Jodi Giglio was re-elected. The change on the Town Board puts a number of Mr. Walter’s proposals in jeopardy for 2018, most notably the proposed $40 million sale to Luminati Aerospace of more than 1,000 acres of town land at the Enterprise Park at Calverton. Also in jeopardy is the zoning at EPCAL, which allows some housing; the zoning in downtown Riverhead, which allows five-story apartments on both sides of Main Street; and the future of the town Industrial Development Agency, which has been under criticism for granting too many tax exemptions to businesses. On each of those issues, there was already some opposition from the existing all-Republican board, which, combined with the two Democrats, could lead to major changes. “I think people were ready for a change,” Ms. Jens-Smith said on election night.